For any kind of disability whether its autism, down syndrome or any other type of disability students need to be able to use some kind of technology to help support them during school or when they are at home. Many people are discovering the many uses that iPads, iPhones and iPod touches can have as tools and resources for people diagnosed with an autism spectrum disorder, Down syndrome or other disability. Using these applications provides these types of children with endless oppturntiues to be sucessful, and continue their social developmental skills. These apps designed for these types of students it allows independence for them to succeed, and have fun at the same time. These apps provide so much resources for these children by having applications that can be used for fun, school work or improving a certain skill for them. These apps are a much better way to go about rather than just the same old curriculum. 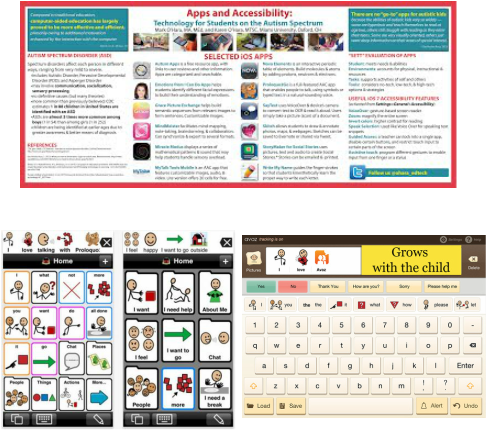 Using these apps it provides students with autism the chance to motivate them and, get them active by exploring technology while having fun. These apps can be used for learning or just having fun. These apps promote social cognition skills and help with artistic peers to socialize with peers just by using this technology it creates a eye opener for these students. All in all these apps allow students to be independent in their lives, and being able to communicate with the world around them. In school using the normal curriculum isn't doing much for their skills necessary to explore, and make something of themselves. When you provide them with different resources you are expanding their understanding and helping them develop new skills. As long as you are giving apps that are appropriate they will flourish in school, and they will develop new skills if you just let them use the technology. A lot of the use In the classroom is for the communication aspect, since a lot o of students with autism struggle with speaking to peers or even their teachers. The technology meets the needs of some students which it is very helpful in the classroom. This technology is another tool in their resources to help meet the needs of students. All in all apps and the iPad are such a useful tool for teaching, letting students explore and endless ways of exploring this unique way of assistive technology.